Some good shirts and some not-good shirts. NEW YORK—A report released Thursday by the Brookings Institute confirmed that some shirts are good and other shirts are not good. The research, conducted over a 10-year period, concluded that the average American has five to seven good shirts, and eight or more not-good shirts. Good shirts, the report confirmed, typically have collars on them. Stating that ties can be worn with good shirts but never bad shirts, the report confirmed that among the nation’s good shirts are white shirts, blue shirts, green shirts, yellow shirts, plaid shirts, and other-colored shirts. Among the bad shirts, the study continued, are white shirts, blue shirts, green shirts, yellow shirts, plaid shirts, and other-colored shirts. Striped shirts, while reportedly sometimes good, can also be bad. In addition, long-sleeved shirts and short-sleeved shirts can be good shirts. 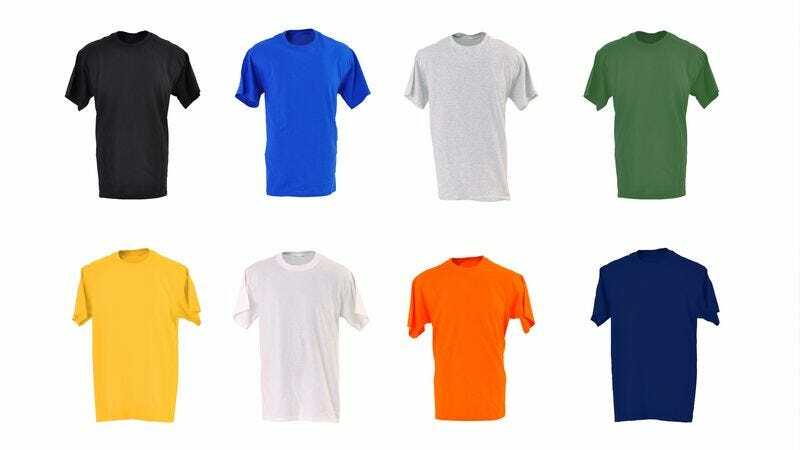 The survey added that T-shirts are most oftentimes not that good, unless they are new, or have a design on them, or the individual just thinks the T-shirt is good because he likes it. Ten percent of shirts, the study noted, are neither good nor bad, but are still perfectly decent shirts. Ninety-eight percent of shirts with stains on them are bad. “My colleague, David, has nine good shirts,” he continued. According to those surveyed, good shirts are worn when an individual plans to be outside and around other people during a planned event, while bad shirts are typically worn while “hanging out” alone inside one’s apartment. Sixty-five percent of the time, shirts with buttons on them are good shirts. Expert analysis concluded that good shirts can be worn to work and bad shirts cannot be worn to work. The report concluded that there are no good pants, all pants are bad, and it isn’t even worth it to go looking for them.